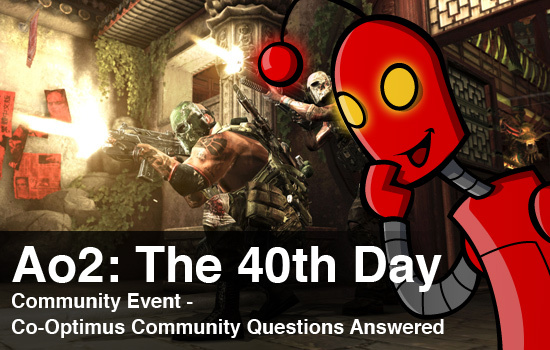 Before heading up to Montreal for the Army of Two: The 40th Day event, we made a post on our boards asking for any questions our community might have for the game’s developers. Today, we provide the answers to those questions that didn’t quite fit into our interview with Eric Chartrand or weren’t covered by our impressions of the Extraction and multiplayer modes. Q: Since the "boss" enemies have been removed (that's still the case right? ), what can we expect for more intense segments of the game? A: I had a partial answer to this particular question based on what we played at PAX, but got the full details at this event. 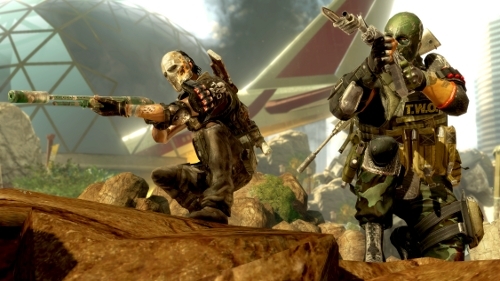 Spenser Norrish, the Army of Two: The 40th Day Community Coordinator, told me that there are no “boss” type enemies per se, however, the bigger, badder enemies (such as the grenade launcher guy) that you encounter do fill the spot of the bosses. These encounters really depend on solid teamwork between players as many of them have some kind of trick for players to work out of how to beat them. Spenser also informed me that as the game progresses, you encounter these enemies on a more regular basis, leading to some pretty intense battles for Salem and Rios. Q: Far too often, your partner is just another gun in co-op games; I'd like to see more in terms of co-op strategy and maybe even solving puzzles. What types of true co-op challenges are in the game? A: While there isn’t any co-op puzzle solving in The 40th Day, there is a lot of co-op strategy. The big, bad enemies you come across are just one example. At the event we played a never-before-demoed level that I can't quite talk about in full detail just yet; however, I can say that this level required a lot of strategizing between my co-op partner and myself. When we played this level for the first time, my partner and I died fairly quickly as we tried bringing down one of those big, bad enemies in a straight on hail of bullets. He just shrugged them off and calmly went after one of us, then the other. The second time we played it, we used the aggro meter to our advantage. One of us got his attention and distracted him while the other shot him in the back. We almost had him down when enemies we hadn’t even noticed before started shooting us in the back. As Jim and I mentioned in our preview from PAX, the enemies in this game do have a bit more intelligence and will seize upon any open opportunity to take you down. From what I’ve played thus far, EA Montreal has done a pretty good job of creating a co-op, shooter game that relies upon communication, teamwork, and strategy to overcome foes, rather than just having your partner bring more guns to bear in a fight. Q: Will there be any language filter options? A: I checked the in-game options and later confirmed with Spenser. No, there will be no language/blood filters in the game. Based on what I’ve played thus far, which I’ll grant you has only been a couple of levels, Salem and Rios seem to be a little more controlled with their language this time around. Which isn’t to say that they don’t curse, but they seem to do so with less frequency. Q: Are we able to ask about general length? Ok, ok, I know what you were really getting at with that. Spenser told me that the average campaign play through it all depends on how you and your co-op partner approach combat situations, the difficulty level you play on (which can be different for each player), how much “running-and-gunning” you do, and the choices you make. If you take your time and plan out how you'll approach each situation, it sounds like a complete run through the game can be between 8 to 10 hours, but again, it's all dependent on players' play style/skill level. Q: Any kind of incentive to keep people playing? A: A lot of the incentives come from the gun collection/customization and the different moral choices players can make. In one play through of the game, players will not be able to see all of the different outcomes of the choices they make, and will not be able to collect all of the different guns/parts that they can use to create their own arsenal of death and destruction. I asked Spenser this question during the event and he told me he’s played through the game twice now, and played through some individual chapters/sections of the game multiple times just to see what happens when you make different choices, either morally or tactically (i.e., try flanking the enemy instead of facing them head on). EA Montreal is hoping that those mechanics will add some incentive, aside from the “fun games are fun to play” factor that’s its own incentive, to the game that encourages players to play through it multiple times.